I don’t talk about every recipe I attempt, mainly because they don’t always turn out nicely. I tried making pita bread, for example, but it was not really fit for human consumption once it had cooled to room temperature. I tried troubleshooting as I was baking it and gave up. Luckily for me, stores around here actually started carrying pita bread (saints be praised! ), so I’ll be able to buy it when I want it. These lentil “meatballs” from Sprouted Kitchen, though, are really something. The recipe had been making the rounds (see Christelle is Flabbergasting for a French version), but I had bookmarked it when I was flipping through The Sprouted Kitchen cookbook. So I finally got around to making them, and they were worth the wait. We all really liked them, even the Little Prince, who generally dislikes legumes. These “meatballs” have a good consistency, they are seasoned well, and the pesto complements them nicely. While they are light, they are also hearty enough to be the focus of the dish – I served them with couscous, though I imagine quinoa or pasta would be really nice, too. I got a total of 25 meatballs, enough for two meals. In a food processor, pulse the lentils into a chunky purée. Put them in a large mixing bowl. Add the beaten eggs, olive oil, ricotta, parmesan, garlic, fennel seeds, parsley, thyme, salt and pepper and stir to mix well. Stir in the breadcrumbs and let the mix sit for 15 minutes to allow the flavors to blend. Preheat the oven to 400 °F and line a rimmed baking sheet with parchment paper or tin foil. In the meantime, make the pesto. Put the garlic, pine nuts, lemon zest and juice and salt in a food processor or blender and run until smooth. Add the basil, ¼ cup of the olive oil and the parmesan and pulse again until smooth, adding more olive oil as needed to smooth it out and a bit of water as needed to get a thinner, sauce-like consistency (this all depends on how you like you pesto, and if you like it on the thicker side, you could decide to forgo the water altogether). The sauce will keep, covered in the fridge, for about a week. Check the lentil mixture by rolling a 1-inch round ball between your palms; it should hold together fairly well. If it seems pretty wet and it falling apart, stir in another tablespoon or two of breadcrumbs to the mixture until the balls with stay together. Roll the mix into balls and line them up on a baking sheet (they don't need lots of space between, they won't spread). If you like a bit more of a crust, brush them with olive oil. You know the saying, “when you give, you receive”? I guess that’s what happened. Several days ago, Lactose Intolerant (@cheesefreepls) retweeted someone’s simple question: is there such a thing as lactose-free sour cream available in stores? So I quickly replied yes, since Green Valley Organics makes one, and I just love helping fellow lactose-intolerant people find it! Then I followed up that tweet with a link to their website, which I copied-pasted right from their homepage – I guess that was going the extra mile, but I was glad to do it. And as I was on the homepage, what do I see in the bottom right-hand corner? LACTOSE-FREE CREAM CHEESE!!! 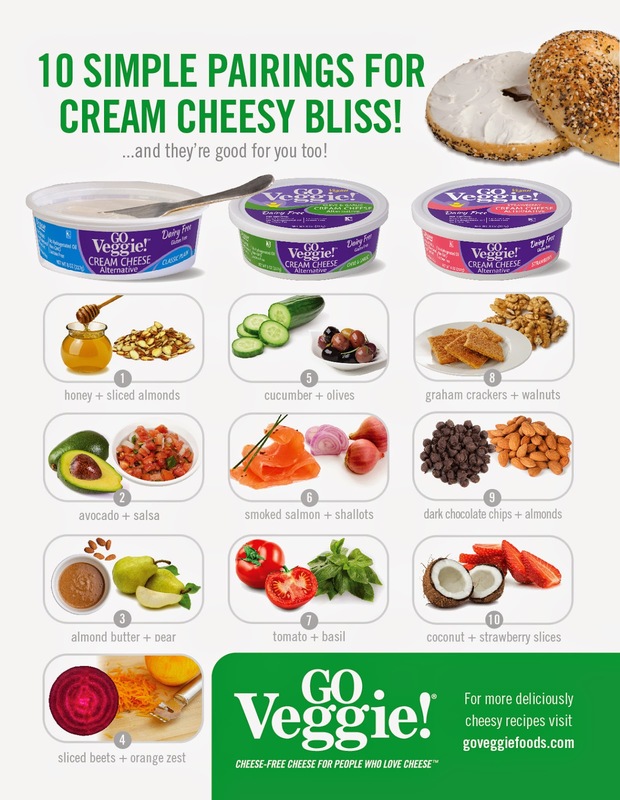 Green Valley Organics makes lactose-free cream cheese, everybody! And I would not have found out if I hadn’t decided to go the extra mile with that second tweet. The Engineer stopped by the Whole Foods at the Quarry on his way home from work Tuesday, so guess what I had for breakfast this morning? Oh, yeah. Cream cheese! I’m including the breakfast shot below (please ignore the torn foil, it bothers me more than it does you) so that you can see the consistency: soft enough to drag your knife across the top and get a satisfying amount of cheese on there. It’s not as tangy as I would have hoped, but it’s way tastier than vegan cream cheese! Do you realize this means that I can make real cheesecake again? Oh, the possibilities! I’m posting this in case anyone wants some for the holidays, though I still have some posts to catch up on (like Thanksgiving dinner and what I’ve made since then!). This totally made my day. Let’s catch up on a few desserts I made lately but haven’t blogged about. I made what was a VERY good chocolate banana cake, vegan to boot, but I have no good pictures whatsoever, so I can’t do a whole post about that. And an apple and pomegranate tarte tatin that was okay, though homelier than expected (despite a beautiful color) and a little too sweet for my taste (which is saying a lot). The crust did have the interesting addition of sour cream as well as butter, but it was less noticeable than I had hoped in the finished product. I won’t bother making it again. There was also a luscious pumpkin cake, which was somewhat blander than it should have been. The cake itself turned out beautiful, with a good crumb, albeit a little healthy-tasting – it might have been better to use white whole wheat flour instead of a mixture of white and whole wheat. Then, as I was making the frosting, it looked like it would fail, but it was a revelation! It was sweet and had a great consistency once all the ingredients were mixed properly. I’d definitely make these cupcakes again. Note, however, that I buy my agave nectar in 11.75-oz. containers, which isn’t enough for the recipe; I topped it off with maple syrup. In a large bowl, combine the flours, baking powder, baking soda, and salt. Set aside. By now, the milk should be ready. Add to it the agave nectar, oil and vanilla and stir. Add the wet ingredients to the dry and mix until just combined and no lumps remain. Pour the batter into the prepared muffin tin, and bake for 18 to 22 minutes or until a toothpick inserted in the center of a cupcake comes out clean and the tops are slightly springy when pressed. Cool the cupcakes in the pan for 10 to 15 minutes, then cool completely on a rack before frosting. Use a mixer to cream butter and agave nectar. When smooth, add vanilla extract and about half the cocoa powder; mix on low speed to combine, then add the remaining cocoa powder. Add in the soy milk powder and beat at medium-high speed until fluffy. If it is runny, refrigerate the frosting until it sets up a while (I did not have to do this, but I imagine that’s what happens if you omit the soy milk powder). I made this because I knew the Engineer would love it. He made a happy, contented face when he tasted it and did, in fact, declare his love for it. I said he seemed to like it so much that it looked like he would marry that cake if he could, and he replied that he married me so I could make him the cake. Turns out, I love it too. But it’s a little dangerous, because it’s just so good! We had to ration out this cake to make it last, and we cut it into 12 pieces if memory serves me correctly (instead of the usual 9 pieces I make when using a square pan like that). I simplified the directions a bit below, because Exclusively Food had instructions more adapted to Australia than North America; I also used a substitute for self-rising flour, so that’s what I wrote below as well. I hope you enjoy it as much as we did! Grease an 8-inch square pan and line the base and sides with parchment paper. Place chocolate, margarine, milk and sugar in a large saucepan (or double boiler, as I did) over low heat, stirring frequently. Remove from heat when chocolate and margarine have melted, and stir mixture until completely smooth. Allow mixture to cool at room temperature for 15 minutes. Pour mixture into the prepared pan. Bake for about 1 hour or up to 1 hour 20 minutes. When the cake is ready, a fine-bladed knife inserted into the center of the cake should come out without any batter attached. Melt white chocolate in a double boiler (or in a small saucepan over VERY low heat), stirring frequently. When chocolate has completely melted, remove from heat and quickly stir in sour cream. Use immediately, or if your ganache is quite runny, set it aside at room temperature to thicken slightly before using. Simply pour on the cake and let stand until it has set. I finally got around to making the kale salad from Green, my favorite vegetarian restaurant. It was shared by San Antonio Express-News. I halved the recipe (which is what I wrote below) to make a reasonable amount, and used soy sauce instead of Bragg Liquid Aminos (I’d just pared down the pantry and fridge and wasn’t going to buy another ingredient for just one recipe). I also toned down the heat. It’s quick to make, and really fantastic! The kale is sturdy enough that the salad can keep for a day or so if it’s dressed, but I still preferred it fresh. Wash the kale in cold water, pat dry, and with a sharp knife, trim off the tough portions of the stems and discard them. Chop the kale into bite-size pieces and place in a large salad bowl; set aside. Combine vinegar, oil, brown sugar, garlic, Bragg Liquid Aminos or soy sauce and red pepper flakes in a sauté pan. Simmer the mixture over moderate heat for 3 minutes, stirring frequently. Remove pan from heat and immediately pour the hot mixture over the kale; mix well to thoroughly coat all of the leaves with dressing. Allow kale to sit for 10 minutes or more before serving. To those of you who are not from Quebec: tourtière is essentially a pork pie. Some people put different meats in there, including venison, and some recipes have potatoes, but this is the bare-bones basic version. It’s traditional fare around the holidays, but to me, it’s a good winter meal! This recipe is from Simple Bites. I liked that it’s un-plain while still being simple, if that makes any sense. It was really good, as a matter of fact! This recipe makes two pies, so I froze one, and I don’t see the point of making any fewer. Since it’s harder for me to cook than it used to be (what with parenting an almost-toddler at the same time), I cut corners and bought pie dough instead of making it. And I’m not even sorry. In a large, heavy frying pan (I used a saucepan), combine pork with cold water and heat to boiling point. It should be slightly soupy. Add onion, celery, pepper, bay leaves, savory, rosemary, nutmeg and cinnamon. Cook, covered, over medium-low heat for 1 ¼ hours; stir often. Add more water if mixture dries out. Halfway through cooking time, season with salt to taste. Stir in rolled oats and cook, stirring, for 1 to 2 minutes. Remove bay leaves and allow to cool. Meanwhile, line two 9-inch pie plates with pastry. When meat mixture is lukewarm, divide it between two pie shells and spread it out evenly. Brush around outer edge of pastry with the beaten egg. Place top crust on the tart and press gently around the edge to seal. Trim pastry, crimp edges and cut steam vents in top crust. Decorate as desired. Bake in preheated 425 °F oven for 15 minutes, then reduce heat to 375 °F and bake another 25 minutes or until crust is golden. [Pies can be frozen directly after assembly, with the dough still raw. Wrap them well in plastic wrap and freeze. To cook, remove from the freezer and unwrap; brush the top with a little beaten egg and place frozen meat pie directly in a preheated 375 °F oven. Bake until golden and heated through, about 50 minutes. J’ai continué à essayer quelques recettes à la citrouille, mais sans trop de succès. Il y a eu notamment les scones à la citrouille avec beurre à la cannelle de Bon Appétit. Au début, je ne les ai pas aimés, mais l’Ingénieur était fan. En y repensant, j’ai décidé qu’il s’agit en fait de bonnes pâtisseries, mais qu’il ne s’agit pas de scones, alors voilà pourquoi j’ai été déçue – la recette porte le mauvais nom. Tout de même, en voici, un nom bien descriptif : muffins aux framboises, au chocolat noir et à la noix de coco, de Coup de Pouce. Tellement bons que le Petit Prince leur a désigné une syllabe! Quand je lui en ai offert, il m’a dit « ké » (pour « cake », en anglais), et je lui ai répondu : « Non, mon chéri, ce n’est pas du gâteau, ce sont des muffins. » Alors il a dit « mô! » et il a retenu ce son pour les désigner. Nous les avons beaucoup aimés tous les deux! Dans un grand bol, à l'aide d'un batteur électrique, battre le beurre jusqu'à ce qu'il soit crémeux. Ajouter le sucre et battre pendant environ 2 minutes ou jusqu'à ce que le mélange soit léger et gonflé. Ajouter les œufs un à un, en battant bien après chaque addition. Incorporer la vanille et le jus de citron. Incorporer les ingrédients secs réservés en deux fois, en alternant avec la crème sure. Ajouter le chocolat et la noix de coco et mélanger délicatement à l'aide d'une cuillère de bois. Incorporer délicatement les framboises. Répartir la pâte dans des moules à muffins. Saupoudrer du sucre, si désiré. Cuire de 15 à 25 minutes ou jusqu'à ce qu'un cure-dents inséré au centre des muffins en ressorte propre. Mettre les moules sur une grille et laisser refroidir pendant 5 minutes. Retirer les muffins des moules et laisser refroidir complètement sur la grille. This recipe is from Live Journal, though I must admit that I do not remember where I found that link. But the important thing is that I have this recipe. I’m editing the presentation and wording below, for clarity, but the recipe is for the same dark and delicious chocolate cake posted by the user. I only urge you to line your pans with paper instead of just greasing them and flouring them, as the original recipe suggested, because that wasn’t enough to keep the cakes from breaking when I unmolded them… The cake itself is a good chocolate cake, perhaps somewhat unremarkable in and of itself (and certainly not like the steamed chocolate cake I thought this recipe was for originally! ), but what makes it really special is the frosting, which the user says is from Joy of Cooking. It’s not a frosting so much as a mousse, and it’s just luscious and decadent when spread over cake! I made it with butter, so I had to take Lactaid, and I’m not sure that this would work with margarine (too soft) or shortening (too bland). The Lactaid was worth it, though, and since this cake is very rich, it lasted for several days in the fridge. It would definitely be a good choice for a birthday cake, or a party where you have guests to help you polish it off! Preheat the oven to 350 °F. Grease two 9-inch round pans; put parchment or wax paper on the bottom and grease again. Melt the chocolate in a double boiler. Set aside to cool. Cream the butter with the sugar. Add the eggs, one at a time, mixing well after each addition. Add the vanilla and cooled chocolate and mix again. Add about a third of the dry ingredients, mixing only to blend, then half of the sour cream, mixing again. Continue adding the ingredients, alternating and ending with dry ingredients. Finally, add the boiling water – the batter will seem very thin, but this is normal. Bake for about 35 to 40 minutes or until a toothpick inserted in the center comes out clean. (I’d check mine at 30 minutes next time, as it seemed a bit dry.) Let cool before turning out onto a rack. Remove from the pan and add the chocolate and butter, whisking until they have melted into the mixture. Add the vanilla and whisk one last time. Get another bowl and make it into an ice water bath. Set the bowl of chocolate in it and, with a handheld mixer on high speed, beat the ever-living heck out of it until the frosting takes shape. (I couldn’t do this, as I don’t have a handheld mixer here, so I used the stand mixer and periodically set the bowl in an ice water bath for 30 seconds or so. I wouldn’t worry too much about cooling it down quickly, though.) The chocolate mixture will be dark and glossy at first, but as you beat it, it will slowly lose its gloss and become lighter. Keep beating until it becomes smooth and lush. Frost your cake as desired, ideally taking care to make a crumb layer. The frosting can be stored in the fridge, though it should be mixed again before being spread on the cake. We’ve all had peanut butter cookies. The kind with crisscrossed fork marks on top that seem to pop up at every bake sale. They’re good, but they’ve got nothing on these salted peanut butter cookies. Nothing! These were, by far, the best peanut butter cookies I’ve had, and now I’m not even sure why I’d make any other kind of peanut butter cookie again. I found the recipe on Orangette, and it’s adapted slightly from Hot Cakes Confections in Seattle (the same Hot Cakes who make vegan caramel sauce). The secret is the quality of the peanut butter as well as the quantity of salt. So that’s two secrets, I guess. And they’re out. So I decided to go all out for this and make my own peanut butter, since I have a Vitamix. (I won’t turn this post into a love letter to Vitamix, but suffice it to say it rocks!) I used 1 pound of roasted peanuts and, as per Alton Brown’s guidelines, 1 tsp. kosher salt. It was the most perfect peanut butter and tasted fantastic! I’d use a few more ounces next time, as I had to top it up with a few tablespoons of Skippy Natural creamy peanut butter. If you’re not making your own (as I suspect most won’t, and I can’t blame you), I recommend natural peanut butter, the kind you keep in the fridge – just make sure it’s salted. Also, note that even though I usually prefer dark chocolate to milk chocolate, Molly Wizenberg says that in this case, the milk chocolate really does go better with these cookies. I used 4 ounces, but would consider more next time, though these are by no means chocolate chip cookies. This recipe makes 18-20 large cookies. Preheat the oven to 350 °F, and line a baking sheet with parchment paper. In the bowl of a mixer fitted with the paddle attachment, beat the butter with the sugars until light and fluffy, scraping down the sides of the bowl as needed. Add the eggs one at a time, beating between each addition. Add the peanut butter and vanilla, and beat on medium-low speed to blend. Add the dry ingredients in three batches, mixing on low speed until incorporated and scraping down the sides of the bowl as needed. Add the chocolate, and beat briefly on low speed, just until evenly incorporated. Using an ice cream scoop – mine has a capacity of about ¼ cup - scoop the batter onto the prepared sheet pan, taking care to leave plenty of space between cookies. (I bake six cookies per pan; if you add more, they run together.) Bake for 15 to 18 minutes, or until the cookies are puffed and pale golden around the edges, but their tops have no color. (The cookies will not look fully baked, and this is crucial if you want chewy cookies!) Transfer the pan to a rack, and cool the cookies completely on the sheet pan. They will firm up as they cool. Repeat with remaining dough (though it freezes beautifully). Il s’agit ici d’une recette trouvée sur les Carnets de Miss Diane. L’idée peut sembler drôle au départ, mais je vous assure que c’est bon! De plus, cette « mousse » est sucrée avec des dates, alors d’un point de vue nutritif, c’est assez bon. Entendons-nous tout de suite : si vous aviez envie d’une vraie mousse au chocolat, ce dessert ne satisfera pas votre envie. Mais si vous vouliez simplement un petit quelque chose de sucré, ou si vous voulez donner un dessert santé à vos enfants, c’est tout indiqué! La recette ci-dessous donne 4 toutes petites portions, alors je n’hésiterais pas à la doubler la prochaine fois. Cuire la patate douce; on peut la cuire au four ou au four micro-ondes, ou encore la faire bouillir. Personnellement, je préfère le four (1 heure à 425 °F). Lorsque la patate est cuite et refroidie, déposer tous les ingrédients dans la jarre du robot. Si la pâte de datte est trop ferme, la passer quelques secondes au four à micro-ondes. (J’ai réchauffé mes dattes un peu.) Actionner à haute vitesse jusqu'à ce que le tout devienne une mousse. Ne pas hésiter à ajouter du lait de coco pour obtenir une mousse plus souple. Déposer la mousse dans une poche à pâtisserie munie d'une douille ronde et remplir de petits ramequins aux trois-quarts. C’est plus joli que d’y déposer la mousse à la cuillère, même si cette dernière méthode convient aussi tout à fait. I promised you another recipe from our last Summerfest, and here it is. It’s Serious Eats’ cumin-scented French lentil salad, which my friend Jen made for lunch one day, and it was delicious. It’s really not complicated to make, you just have to take the time to pick through lentils and finely dice vegetables, but it’s well worth it. I liked this salad eaten warm, and it was great straight from the fridge the next day, too. Enjoy! Combine lentils, chicken stock and bay leaf in a medium saucepan. Bring to a boil, then turn heat down and simmer until lentils are just tender, about 25 minutes (or about 20 minutes for common lentils). Strain and let cool. In a large bowl, combine all remaining ingredients. Add cooled lentils and toss to combine. Taste and adjust seasoning if necessary. Refrigerate until ready to serve. A quick little post for a quick little side dish. I had meant to make this Naturally Ella recipe at one point, and bought the ingredients, then I ended up making something else instead. I can’t remember why, but more’s the pity, because this was fantastic! On the bright side, all the ingredients keep well, and they’re all things that are usually in my pantry or crisper drawer, so hopefully it should be easy to make again on a whim. I’d consider omitting the golden raisins, and it should be noted that I completely forgot the broth. And still, still, this was delicious. The Little Prince loves carrots, too, so this was a win all around! I served them with turkey meatballs, but I imagine they’d go well with just about anything. Bake carrots for 30 minutes, uncover, and then bake for another 10 minutes. Serve over cooked grains or as a side. It seems like I haven’t posted a breakfast recipe in a while. It also seems like I never know what to eat for breakfast, so I certainly like having the time to make something special! I made yeasted buckwheat pancakes, but I’m not sure the Engineer really enjoyed them. Plus, they aren’t great to make in the morning, because the batter has to rise for an hour. For something faster, I much preferred overnight oatmeal with blackberry chia jam, though of course you could use just about any jam you want. The jam, which is actually just chia seeds that have absorbed fruit juice, is very quick to make, and the oatmeal just sits overnight in the fridge. When you’re ready for breakfast, just warm up the oatmeal in the microwave, add jam and dig in! In a large bowl (or other container with a lid), combine the oats and milk. Cover and store the container in the fridge overnight. The next morning, layer the soaked oats into jars with jam (I prefer to warm up the oatmeal first). Sprinkle the coconut on top, and add anything else you might want, like nuts, seeds or fruit. Deux recettes d’un coup! Pas parce qu’elles vont vraiment ensemble, remarquez, mais j’ai fait le poulet avec des morceaux de courge poivrée agrémentés de tamarin, et en fin de compte, cette dernière recette n’était pas géniale. Mais j’avais récemment fait un tian de courge qui était si bon que nous l’avons tous approuvé, y compris l’Ingénieur! À noter que la recette se double facilement; il suffit de prendre un plat de 9x13 pouces. La recette de poulet au gingembre et au sirop d’érable a été créée par la famille Lavallée-Labbé pour le site Poulet du Québec; eux recommandent de servir ça avec pommes de terre et céleri-rave en purée et pois sucrés, ce qui a l’air très bon aussi. J’ai réduit de moitié les quantités pour la sauce, ci-dessous, parce que je trouvais qu’il y en avait beaucoup trop, et je ne veux pas gaspiller le sirop d’érable que je rapporte du Québec! Enfariner les morceaux de poulet. Dans un grand poêlon, faire chauffer l’huile à chaleur moyenne et y faire cuire le poulet de 8 à 12 minutes ou jusqu’à ce qu’il soit doré des deux côtés. Verser la sauce sur les morceaux de poulet et faire mijoter quelques minutes, à feu doux. Dans un robot, mélanger tous les ingrédients sauf l’huile d’olive. Ajouter l’huile d’olive et mélanger jusqu’à ce que la chapelure soit ramollie et verte, en ajoutant un peu plus d’huile au besoin. Assaisonner. Garder dans un contenant hermétique dans le réfrigérateur jusqu’au moment d’en avoir besoin. Pendant que la courge cuit, faire chauffer une petite casserole d’eau salée à feu élevé. Une fois l’eau à ébullition, ajouter le riz. Faire cuire pendant 10 minutes, puis égoutter et mettre de côté. Faire cuire au four préchauffé pendant 35 minutes ou jusqu’à ce que le dessus soit légèrement croustillant et que le mélange ait l’air plus solide. Servir tiède. I made a black bean chili before that was somewhat ho-hum. I was a little reluctant to try again, so I kept putting it off. But I recently purged my pantry, and I had some Rancho Gordo turtle beans to use up, so I tried a new recipe from Real Simple. I used this Serious Eats article to figure out that I needed ¾ cup of dried beans (soaked and cooked) to equal a 15-oz. can of beans, and I used this eHow article to figure out how to make the recipe in the oven instead of a slow cooker, since I don’t have the latter. Those are the directions I’m giving you below, but you can refer to the original post if you want to make this in a slow-cooker. I also adapted the spices a bit. In any event, this recipe was delicious! Now *this* is a vegan chili I can get behind. I topped it with lactose-free sour cream and green onions, though grated cheddar would be good, too. I also served it with my mother’s 5-grain soda bread, which to me is the best accompaniment for chili. I once posted the recipe in French, but here is our version, in English. It’s originally an Anne Lindsay recipe, and she calls it a 5-grain soda bread, but upon closer inspection, it’s really only 4 grains: wheat only counts once to me, even if you are using two different kinds of wheat flour! It’s great bread, though, and easy to make. Cover, put the pot in the oven and cook until the sweet potatoes are tender and the chili has thickened, about 2 hours. Serve the chili with lactose-free sour cream, scallions, sliced radishes, grated cheese or tortilla chips (or whatever your favorites are). Preheat the oven to 350 °F. Prepare a baking sheet by covering it with parchment paper or greasing it. In a large bowl, mix all the dry ingredients. Add the oil and buttermilk and stir to make soft dough. Place on prepared baking sheet; flatten into a circle about 2 ½ inches thick. Cut a large X about ¼-inch deep on top. Bake for about 1 hour or until toothpick inserted in center comes out clean. I used a disclaimer on several posts in the past months because I’d made certain recipes using GO Veggie! lactose-free products that had been sent to me for free by the company. It’s high time I elaborated on that! Late last summer, I got an email on behalf of GO Veggie! asking if I was interested in receiving free samples. I had bought their plain and chive & garlic cream cheese substitute before, but that was pretty much it. I read the email over and realized that they had products I’d never tasted, like a strawberry cream cheese substitute, and some that I’d never even seen in stores. So I decided to accept their offer and expected to get some flavored cream cheese and maybe a few other things. I didn’t think about it for a while, and one day when I came back home from the dentist, the Engineer said, “I don’t know what you did, but you got a visit from the cheese fairy while you were out!” Look at everything we got! That’s a block of cheddar, a block of mozzarella, a container of grated parmesan, three kinds of cream cheese (plain, strawberry, and chive & garlic), four kinds of grated cheese (mozzarella, cheddar, a cheddar and pepper jack mix, and a cheddar and Monterey jack mix), as well as seven – count ’em, seven! – kinds of sliced cheese (smoked provolone, pepper jack, cheddar, mozzarella, cheddar with jalapeño, American, and Swiss). I tasted them and I think this is relevant to the blog, as these are all products that can come in handy for people who are lactose-intolerant. Just to be clear, though, while I got all these products for free, I am not actually getting paid to write this review. I haven’t seen all these products at my grocery store, so you might have to go to specialty stores or talk to your grocer to try some of them. Keep in mind that while they are lactose-free, they are not all dairy-free or vegan, so they are not suitable for people with dairy allergies, for example. As this page on their website explains, GO Veggie! products have some advantages over dairy and over many dairy substitutes, like fewer calories, less fat (no cholesterol and no trans fats, actually), and more calcium. And, of course, they’re lactose-free. For those of you who are interested: the cream cheeses are dairy-free (casein-free) and soy-based; they are also vegan and kosher. In addition, the following products I got are dairy-free (casein-free), soy-free, vegan and kosher: shredded mozzarella, as well as sliced American, cheddar, mozzarella and pepper jack. The other products are made with soy and do contain some form of dairy, though not lactose. (This may go without saying, but just to be safe: always check the label before eating something if you have an allergy, because sometimes companies change recipes or suppliers or packing plants, so the information here may be out of date eventually.) GO Veggie! also makes products that I did not taste, so I can’t speak for those, but there are alternatives not mentioned here if your food restrictions prevent you from trying them (such as a dairy-free grated parmesan substitute). Let’s do this methodically, shall we? For the blocks of cheese (cheddar and mozzarella), I am not fond of eating them straight. To be fair, I don’t think I’ve ever had vegan cheese that I enjoyed eating raw like that, so for me, a lactose-free dairy cheese is a better choice. (Though to be clear, these GO Veggie! blocks of cheese were not vegan because they contained some dairy; they just tasted vegan, if that’s a thing.) That being said, I grated them and used them in a mac and cheese: it was very good! The Engineer, the Little Prince and I all approved. As for the grated parmesan, it wasn’t as good as real parmesan, but it was definitely on par with parmesan from a green can; it also smelled remarkably similar! I use it to top dishes, like the spinach and ricotta crêpe lasagna I made. This cheese isn’t vegan either, but the website says there is another dairy-free one. However, I only recently realized (or was reminded?) that real parmesan isn’t even vegetarian, as it contains animal rennet; GO Veggie’s grated parmesan is vegetarian, as far as I can tell. I tried the shredded mozzarella on pizza, and I was really impressed because this cheese mot only melts, it stretches! I thoroughly approve. It was great in tacos, too. The Engineer ate the cheddar and pepper jack mix; he liked it in sandwiches, and it baked up very well in biscuits, too. I used the cheddar and Monterey jack mix in a Mexican lasagna and I couldn’t even tell it wasn’t real cheese! I used shredded cheddar in an omelet, and it was good, though nothing unexpected by that point. 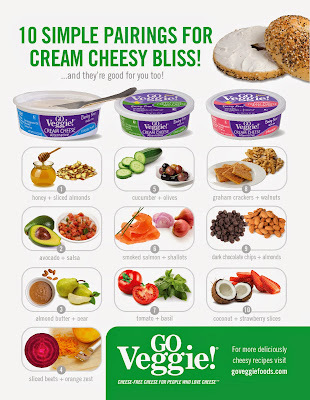 Finally, the cream cheeses: I’m including an image sent by GO Veggie! with ideas for different flavor combinations – I never got around to trying them, mostly because I rarely serve hors-d’œuvres like that, but some of these combinations looked really good to me. I enjoy the chive & garlic one on crackers mostly, or on a bagel for lunch, but it isn’t the kind of thing I like for breakfast. I think it would also be really good in a savory dish like a lasagna that calls for cream cheese. As for the plain cream cheese, I compared it with Daiya’s version, and I preferred GO Veggie! because it wasn’t as sweet. Sweet is fine if you’re making frosting for a cake, for example, but when you just want plain cheese on a bagel, I prefer a more neutral taste. The strawberry cream cheese is made with soy, and when eaten by itself, the soy is really obvious, but it was great on a sesame bagel! It also had the consistency of real cream cheese, so that was good. I used both the plain and strawberry cheeses in frosting for rhubarb cupcakes, and both worked really well. In conclusion, I really liked discovering all these new products, because it gives me new lactose-free options for my cooking. I hope the same is true for you after reading this post. I know, I know. I’ve told you about apple cakes before. There was my ”stout” apple cake, Bubbie Gilda’s apple cake, French apple cake, and apple tart cake. And I’ve got a few more up my sleeve. But somehow I made another one, slightly adapted from Sweet Amandine, and it was good enough that I decided to keep the recipe… The Engineer also approves and says that it has a good, dense crumb, with brown sugar that you can taste without being overwhelmed by it. He also likes the crystallized sugar on top, as do I. I’m changing the cooking time slightly below, as I would have liked to test the cake 5 minutes earlier than I did. I also changed the flour a bit, replaced some of the oil with applesauce, and omitted the nuts, obviously. Enjoy! Preheat the oven to 350 °F. Grease and flour a 9-inch round cake pan. In a medium bowl, whisk together the flours, salt, cinnamon, and baking soda. Set aside. Dump the packed brown sugar into the bowl of a stand mixer and unpack it with a fork. Add the oil, and use the fork to moisten all of the sugar. (If you skip these first steps, the brown sugar will get pressed up against the sides of the bowl instead of mixing with the oil.) Beat the oil and sugar together in a mixer fitted with the paddle attachment. After five minutes, add the eggs and the vanilla, beating after each addition, then continue beating until the mixture is creamy. Add the dry ingredients into the sugar, egg, and oil mixture and stir by hand until just combined. Fold in the apple slices. It will look like a lot of apple and not enough batter, but it all works out in the end. Transfer the batter to the prepared pan, sprinkle with demerara sugar if you'd like, and bake for about 40-45 minutes, until a toothpick inserted in the center of the cake comes out clean. Cool in the pan before turning out. For some reason, I was certain I had a vegan pancake recipe here, but I can’t find any. That’s an oversight on my part, I suppose! I had only taken a perfunctory picture, because I really thought I had these on the blog already – I’d have made more of an effort otherwise. Vegan pancakes come in very handy for many reasons, not least of which is allergies. They’re also easy to make! The recipe below is from Food.com, and it’s the one my friend Jen made last SummerFest. I followed the recipe as written, and the only downside to these is that I could taste the baking powder too much, so I might try it with less next time, even if that means a flatter pancake. When we were at the cottage, though, Jen followed the recipe and the pancakes did not taste off at all. I got a yield of 7 pancakes, so I assume a yield of 6 to 8 is reasonable for the recipe as written below. Now the pan should be ready for your batter, so spoon one pancake’s worth of the mixture into the pan. Flip when you see bubbles in the middle of the pancake and the edges are looking stiffened. Repeat with the rest of the batter. You remember last fall’s attempts at pumpkin ice cream, right? I talked about them here and here. I tinkered with spices and custard base, but the problem was the consistency: too hard once in the freezer for more than a few hours. So I upped the fat content, I used coconut milk with guar gum, and I tried adding arrowroot starch after tempering the yolks (arrowroot which, by the way, worked for me before, and that’s how it’s done in The Vegan Scoop for just about every kind of ice cream, including pumpkin). Still, I didn’t get the consistency I wanted. I’m wondering if that’s just the way it’s meant to be – it is, after all, a downfall of many homemade ice creams, even non-vegan ones with sour cream. According to Serious Eats, the only thing left to do would be to replace some (or all) of the sugar with liquid sweetener such as corn syrup. But you know what? I’ve made this a half-dozen times already and I’m tired of tinkering with it, especially since the arrival of a cold front makes me want warm food, not ice cream. So the following is my pumpkin ice cream, inspired by a Herbivoracious recipe. I made it last month and loved the taste. Just remember to take it out of the freezer 10 to 15 minutes before you want to eat it. I might try liquid sweetener if I make it next year, though do report in the comments if you try it! You could also use 1 tsp. pumpkin pie spice instead of the spices below. Whisk together the pumpkin purée, coconut milk, coconut cream, sugar, salt and spices in a saucepan. Heat and whisk until the sugar is dissolved. In a separate bowl, whisk together the yolks. Gradually pour some of the coconut milk mixture over the yolks, whisking constantly as you pour. Scrape the warmed yolks and coconut milk back into the saucepan. Strain the custard if needed, then refrigerate to chill thoroughly. This recipe had been sitting in my inbox for 2 ½ years already. The story behind it is that my mother’s colleague from work at the time heated his lunch in the microwave, and it smelled so good that my mother asked for the recipe, then shared it with me. But it’s one of the longest recipes I’ve seen, and it just seemed so daunting that I didn’t have the heart to make it (and neither did she). But last month, my mother came to visit us for several days, so we made it together. When I wrote it down on that week’s menu, I wrote “Complicated Chicken”. I might as well have called it This-(Damn-Well-)Better-Be-Good Chicken, but in the end, the original title is more descriptive. I’m not exaggerating when I say this: the spice mix is prepared the night before so that the chicken marinates overnight, and then that evening’s preparations took us 2 ½ hours. That’s 150 minutes of non-stop cooking by two fully capable adults (though, to be fair, we did have to entertain the Little Prince at the time as well, and after a little more than 2 hours, we started a Baby Einstein video for him to keep everyone sane). You know the old adage that the degree to which children like dinner is inversely proportional to the time you spent making it? It turns out it’s absolutely true. The Little Prince hardly touched his dinner the first night. On the second night, however, when all we had to do was reheat it, he had an almost voracious appetite and really liked the dish. As for us, we thought it was very good, but not enough to go through the trouble of making it all again the same way. The recipe below contains a few modifications that we implemented (such as omitting the chile de arbol or not putting plastic wrap in the oven, for God’s sake). Next time, however, we would bake the chicken in a Dutch oven, with half as much broth and fewer vegetables (the fennel, for instance, was surprisingly washed out and could probably be omitted). You could also use a small fresh tomato instead of leaving most of a can of tomatoes unused. My mother would prefer regular couscous, to soak up the sauce better, but I prefer the texture of pearled couscous. It’s not that any of these steps is complicated per se (couscous is easy; the date relish is stupid-easy; the saffron onions take a while, but are not hard), but all together, it’s too much for one cook on a weeknight, especially if kids are involved. We also argued semantics: is the date condiment really relish? After looking it up, we realized that what defines relish is basically the addition of vinegar. While this condiment isn’t very acidic, the lemon juice might qualify it as relish, so we decided to keep calling it that. In any event, this dish makes about 6 servings, so at least you get leftovers for all the work you put in. And it IS really good. Toast the cumin seeds and coriander seeds in a small pan for a few minutes until the seeds release their aroma and are lightly browned. Grind them in a spice mill or a mortar and pestle. In a small bowl, combine the ground spices with the garlic, thyme, parsley, and paprika. Place the chicken in a large bowl; sprinkle the spice mixture over it and, using your hands, toss the chicken and spices together, coating well. Cover and refrigerate for at least 4 hours, but preferably overnight. Heat a large sauté pan over high heat to 2 minutes. Swirl in the olive oil and wait 1 minute. Place the chicken legs, skin side down, in the pan and cook for 8 to 10 minutes, until golden brown and crispy. Every so often, swirl the oil and rendered fat around in the pan. Turn the legs over, reduce the heat to medium and cook for 2 more minutes on the other side. It may be necessary to do this in 2 batches, adding oil if necessary. (Also, as was noted above, I’d do this in a Dutch oven next time and keep using that for the rest of the recipe.) Set the browned chicken aside. Pour off some of the fat and return the sauté pan to medium heat. Add the onions, fennel and bay leaves. Cook for 6 to 7 minutes, stirring often, until the vegetables are lightly caramelized. Add the tomatoes and cook another 5 minutes, stirring and scraping with a wooden spoon. Add the sherry vinegar, white wine and sherry. Turn up the heat to high and reduce by half. Add the chicken stock and bring to a boil. Add the cilantro, give it a stir and then spoon the vegetables into the bottom of a large casserole or braising dish. Arrange the chicken in one layer in the dish, skin side up, and then pour the broth over it. The liquid should not quite cover the chicken. (This was fine in a roasting pan. However, using a Dutch oven and keeping the lid on might allow for the use of only half the amount of broth, thereby avoiding waste later in the recipe.) Cover the dish in aluminum foil, place in the oven and braise for 1 ½ to 2 hours. While the chicken is braising, make the sides. Toss the dates with the olive oil, lemon juice, parsley and cilantro. Season with salt and pepper. Toss the saffron threads in a small pan over medium heat until they are just dry and become brittle. Be very careful not to burn the precious saffron. (We erred on the side of caution here, especially given that saffron is brittle to begin with! As long as it’s fragrant, call it a day.) Pound the saffron to a fine powder with a mortar and pestle. Heat a large sauté pan over medium heat for 2 minutes. Add the olive oil, butter and saffron. When the butter foams, add the onions, bay leaf, and thyme, along with salt and pepper. Cook 8 to 10 minutes, stirring often, as the onions wilt. Turn the heat down to low and cook for another 20 minutes, stirring every now and then, until the onions are soft and sweet. Taste for seasoning. Bring a large pot of salted water to a boil over high heat. Add the couscous and cook 6 to 20 minutes, until tender but still slightly al dente. Drain the couscous, return it to the pot and toss with the butter, parsley and a pinch of pepper. Taste for seasoning. Turn the oven up to 400 °F. Transfer the chicken to a baking sheet and return it to the oven to brown for about 10 minutes. Pour half the chicken broth and vegetables into a sauté pan and heat over high heat until it has reduced and become thickened. Pour the thickened sauce into the bottom of a serving dish and pile the crisped chicken on top of it. The second time I plated this for myself, I put the chicken and sauce on top of the couscous, and I liked that better than when it was next to it. The onions are fantastic and would go well with almost any other dish, too, as would the date relish. If you make it this far, sit back, relax, and enjoy a great meal. Worry about the dishes later.